This advanced rotational vibration sensor enables easy extraction of high-resolution acoustic signatures from rotating components in harsh environments. Rotosense is the foundation for improvements in safety and performance as well as a reduction in maintenance costs for the lifecycle of rotating components. For applications in rail, transportation and energy, RotoSense is ideal for real-time monitoring of vibrational signatures in rotational shafts for early fault detection. 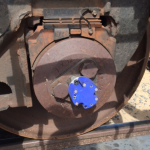 Train wheel abnormal vibration can be used as an early warning system to avoid potential catastrophe. Low-cost development kits and integration support are available for testing and deploying a real-time reliability data system for advanced diagnostics and prognostics health management application. Q-Star Test instruments are small, high performance, plug-and-play, intelligent measurement instruments for probe and final test applications. They are designed for high-speed high-quality (accuracy and high measurement repeatability) current measurements. This is a family of IDDx measurement instruments supporting cost-effective applications of true IDDQ, delta-IDDQ, advanced IDDQ, IDDT, and analog IDD test strategies to digital, analog, and mixed-signal circuits, for yield improvement, cost reduction and product quality enhancement. The Q-Star Test systems have a proven track record of improving test results without increasing test times, even for high-complexity devices and advanced deep-submicron technologies at both wafer probe and final test. 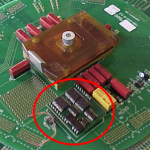 Combine Q-Star Test hardware with your interface board design and our proprietary software into your production test flow and see what you have been missing. 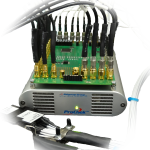 ProChek and ProChek Plus are low-cost, highly accurate platforms to accompany your Wafer Probe Station that eliminates the need for two racks of conventional rack and stack hardware and bulky cabling. With the ProChek family, automated scripts for extracting TDDB, xBTI and HCI are easily applied on test coupons. Foundry processes down to 14nm have been characterized with 7nm next on the docket. Ridgetop Group is the leading expert of advanced prognostics and diagnostics with yearly contributions to the industry through its innovative concepts introduced at a multitude of conferences such as the IEEE Conference on Prognostics and Health Management, AutoTestCon, IMAPS Conference and International Test Conference. You can find abstracts, links, and whole texts of our award-winning papers inside our Resource Library.